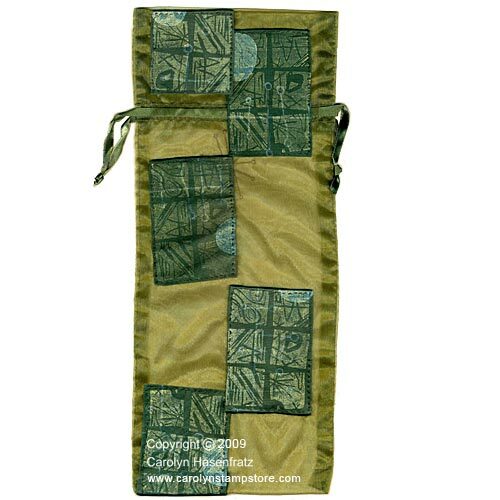 Decorated Wine Bag Share Your Work! I rubber stamped onto fabric with Lumiere, painted on the surface with Dye-Na-Flow, overprinted some more with Lumiere, then I let the fabric dry and heat set it. Then I cut the stamped fabric into patches and sewed them onto the bag. The rubber stamps are from [url="http://www.carolynsstampstore.com"]www.carolynsstampstore.com[/url]. Nice!!! and thanks for sharing! wow .. ! i like it ..the color of the bag is perfect for any outdoor activity ..
Good gift for Father's day! (hint to my wife! :p ) Is it insulated also?